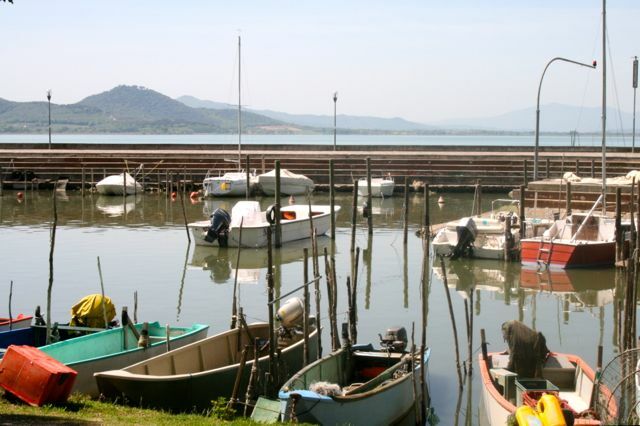 In May 2012 I cycled the 60 kilometre route around Lake Trasimeno on a beautiful spring day. We set off from Tuoro along unpaved roads and tracks marked with green arrows as the “PCT” or Percorso Ciclabile Trasimeno (Trasimeno Cycling Route) and a smattering of red MTB signs as the “Grande Anello Trasimeno” (Great Trasimeno Ring). 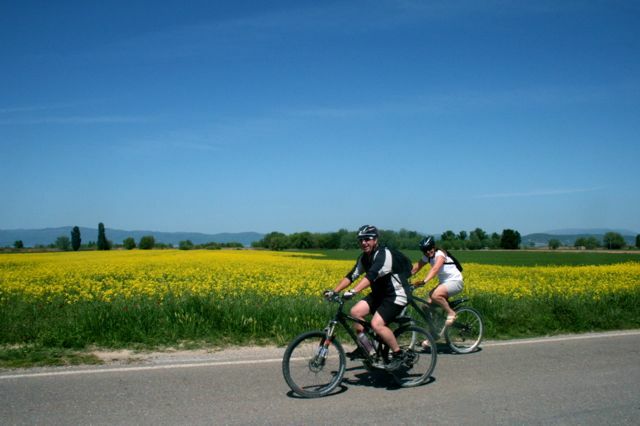 If you are on holiday on the Tuscany Umbria border and don’t have a bike, you can hire them from several points around the lake, including Tuoro Lido, our point of departure. 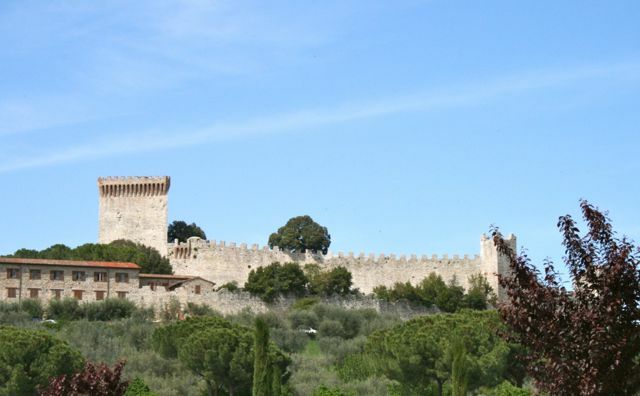 We set off in a clockwise direction and soon found ourselves cycling through the busy lakeside town of Passignano. One or two of the party thought we should stop here for a leisurely coffee, but our group pushed on, heading down the eastern shore of the lake. Later on when we reached San Feliciano, near the south eastern corner, we all agreed it was time for a break at a lakeside bar. It was very relaxing looking across the water to Isola Polvese. Feeling refreshed, we set off once more, however, I couldn’t resist stopping to photograph the fishing boats in the San Feliciano Marina. I soon caught up with the rest of the gang, but we were starting to spread out along the trail. The leaders stooped at this picturesque point on the southern shore while we regrouped. It wasn’t far to our next destination, San Archangelo, where we headed to La Perla Nera, a restaurant that served a two course meal with wine and water for €10 a head, it would be hard to find a better deal than that! Most of the next stretch to Castiglione del Lago was along surfaced roads, there were still lovely views across the fields to the Lake and the surrounding hills. 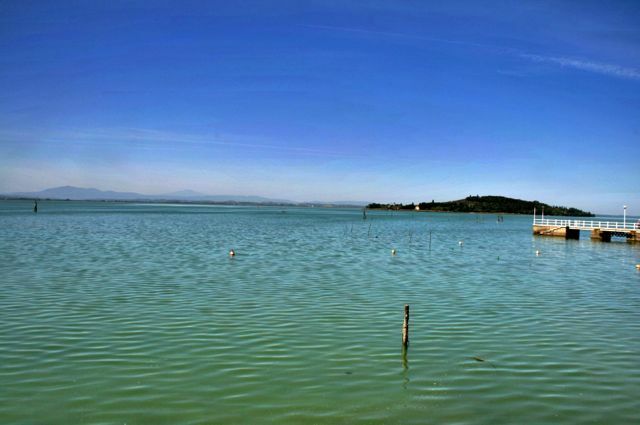 As we entered the outskirts of Castiglione del Lago we turned right and followed the quieter lakeside road. The Rocca, or castle, which dominates this part of the lake, loomed above to our left. We stopped here for refreshments and wandered down to the lake shore, the shallow water at the edge was quite warm. This was quite a change from three months ago when the lake started to freeze over in a bout of prolonged, and very cold, winter weather. I had never come down to this bit of the shore, usually we head to the beach at Tuoro as it nearer, but this looked like it might be worth a visit, it just shows that a bike is a great way to discover new places. 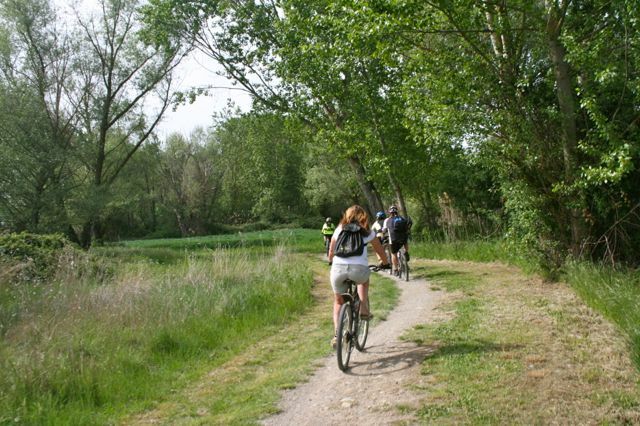 Soon, we were back on our bikes for the last stretch to Tuoro. 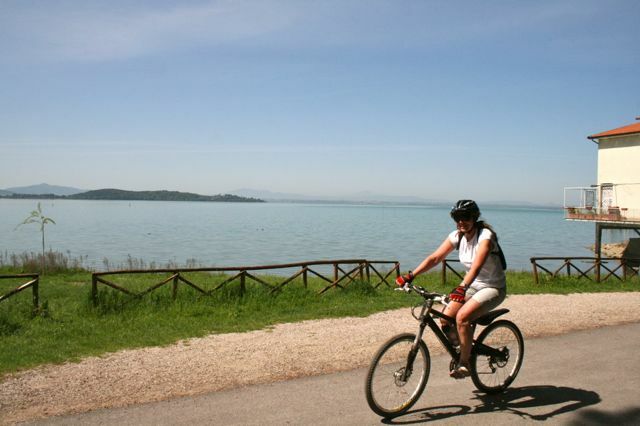 This part of the ride starts at Castiglione del Lago Aerodrome and follows pleasant and well maintained lakeside tracks. It was a hot afternoon and we were grateful for the shade of the trees. 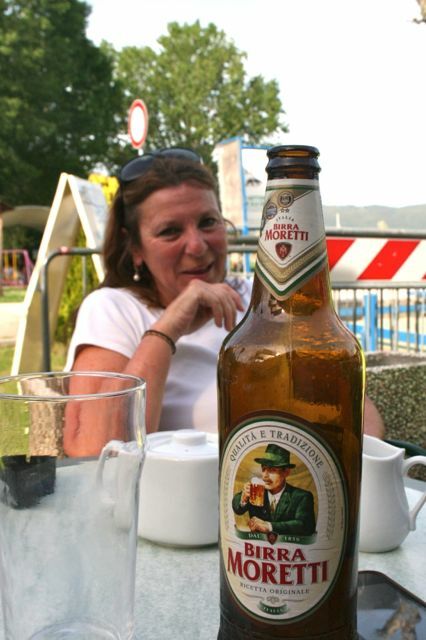 Finally we arrived back at our starting point, Tuoro Lido, it was definitely time for a cold glass of Birra Moretti!